Heavy gauge walls and well-fitted lid and double handles for carrying and a self-basting underside to the lid for cooking turkeys and roasts. The lid has a deep lip for holding hot coals to turn this into a warming oven outdoors. The self-basting lid will make some of the best turkeys or roasts and prevents the meat from drying. 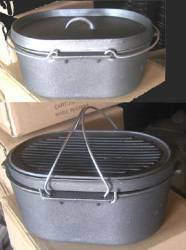 This heavy cast iron pot will last forever and can be used on stovetops or outdoors over hot coals for the Dutch Oven cooking specialist. These Dutch Ovens are pre-seasoned with a factory coating of vegetable oil and will blacken over time.